Description: This tree is the first to bloom in spring. 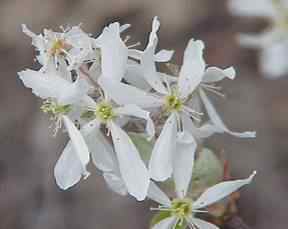 The scientific name of this species means "tree like member of the Amelanchior group". This group has numerous species, but this is the most familiar under the name Shadbush or Shadblow because along the Atlantic section of their range they flower about the time the shad run up the river to spawn.The white or occasionally pinkish flowers come just before the leaves and have 5 strap like petals, a mark of the clan. The fruit is berry like, varying in size and color according to the species. 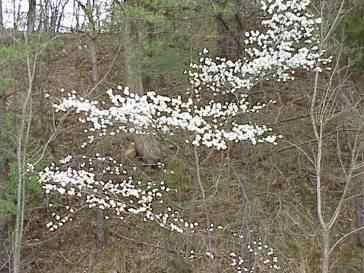 The serviceberry shown here may be anything from a shrub to a 60 foot tall tree. The Leaves are 2 to 4 inches long, the petals about 1/2 inch long. and the redish purple fruit is about 3/8 inch in diameter and rather tasteless.